The set of violin concertos that comprise Antonio Vivaldi’s The Four Seasons are a landmark in musical history. Theorists in Vivaldi’s day had their doubts about the Italian master’s attempt to write to a narrative and critics still argue over whether music without words can tell a story. The works, which are amongst the most famous of any era, were accompanied not just by a set of poems, possibly written by Vivaldi himself, a literary backdrop to underpin the music, but also instructions to his instrumentalists to adopt specific characters while playing to breathe life and expression into his compositions. 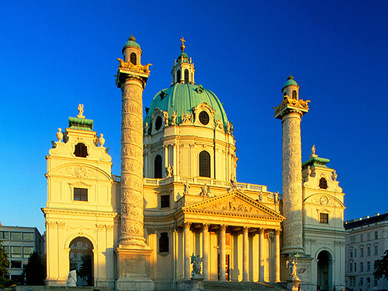 Published in Amsterdam in 1725, Vivaldi would have been writing The Four Seasons at the same time as Vienna was witnessing the construction of the Karlskirche, the venue for this special set of performances. St Charles Church, which was built in memory of Charles Borromeo, a leading figure of the Counter-Reformation, is a stunning example of the ornate glories of baroque architecture. The Four Seasons are one of the most recorded pieces in the history of music, yet few people have had the opportunity to hear the concertos as they were played in Vivaldi’s lifetime. 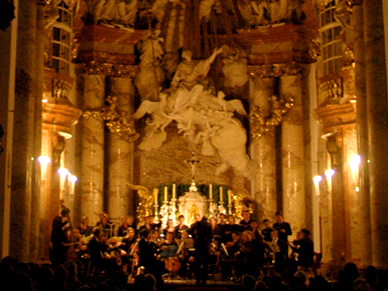 That is the experience offered by Orchestra 1756 and the soloists of the Salzburger Konzertgesellschaft in their interpretation of Vivaldi’s revolution in musical form and meaning. Dedicated to re-creating the sound of the eighteenth century, Orchestra 1756’s concerts are played exclusively on period instruments. Interspersed with some of Vivaldi’s most beautiful arias for alto, these concerts reach out across three centuries to a period that still has the power to communicate with us today.